A new, queerer take on an ancient form of art. This is part two in an ongoing series. As promised, I am back writing for TheColumn about queering the tarot one tarot card at a time, and we’re going to go in order—as such, our first card is The Fool, O. This is one of my favorite cards in the deck because it promises new beginnings, unfailing optimism, and a fresh approach at life. Once we dive a little deeper into the tarot, The Fool begins to take the specific shape of someone just beginning a new journey—frequently this card comes up for people starting school, a new job, or who recently had a series of epiphanies leading to a better life. 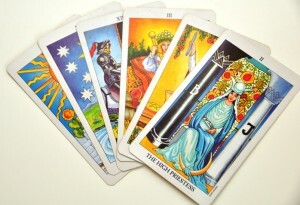 A few things to keep in mind that are usually true about this card: it is often specific to starting a new phase, it signifies entering this phase optimistically, and is usually indicative that the querant (the person whose cards are being read) is about to go on a journey full of ups and downs, but that ultimately leads to happiness and success. Now, how can this card relate differently for queer-identified readers? For starters, this card frequently comes up for people who are either considering or who have recently come out of the closet, and this is certainly a major point in most queer people’s lives that the tarot can have a lot to say about. In the case of queering The Fool however, I would also encourage looking a little deeper. Typically queer people, especially those who grew up or still live in unwelcoming communities, battle themselves daily. There is frequently a lot of internalized queerphobia and self-loathing. In this case The Fool may not symbolize coming out at all. Instead, it symbolizes that moment when we realize we are wonderful the way we are–queer or not, that big shift in our minds when we stop hating ourselves, stop being angry, and start living the glittery fabulous life we were meant for. This is brings a sense of lightness, throws us into a brand new phase of life, and certainly lifts that giant burden society tried to throw on us. 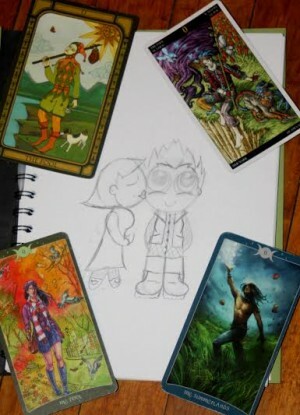 Other alternative readings that you can explore include: If you get this card and a card indicating love, your first queer relationship may be just around the corner—or one free from the baggage you’ve dealt with in the past. If you are reading someone young or closeted, it could be a sexual awakening or becoming aware of your true identity. If you are wanting to take on a larger role in your local queer community, picking up an activist role could be a life changing experience that sets you free in many ways, and finally, if you get a lot of cards indicating family or social life, you are just about to find your queer family—the one you’ve dreamt of since you saw your first gay movie. See the introductory article, Queering the Tarot.